Introducing a New Guest at the Refuge: Could it be Agaricus californicus? Agaricus are notoriously difficult to identify. Therefore, it was with a large measure of caution that we attempted to identify and welcome Agaricus californicus to the refuge. We've encountered Agaricus before, but this one really caught our eye as we drove up our old logging road late in October. 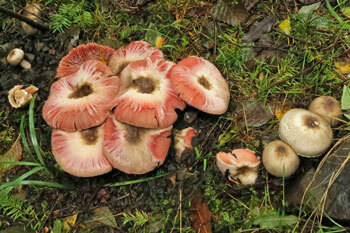 How could we miss these large clusters of mushrooms with dazzling pink gills in the rain soaked specimens? We immediately went to work in order to identify these newly encountered mushrooms. We're breathing a collective sigh of relief. We made a foray into our favorite mushroom haunts on Mt. Hood on Friday afternoon before the rains once again drenched the landscape. 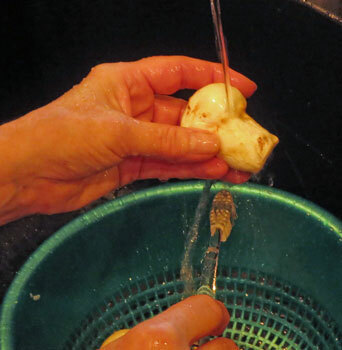 And, we left with baskets cradling a lovely, pure white Coral Hydnum, 8 pounds of Matsutake (commonly referred to as the Pine Mushroom) and 1.5 pounds of fully emerged White Chanterelles. Friday was a delightful fall-like day with comfortable temperatures in the mid-60's. November's earlier downfalls had enlivened the forest floor, and we were greeted by a wide variety of mushrooms, including some choice edibles, at the 3,000-4,000 elevation. is one small step in our multi-step preservation process. Are you as fond of the Great British Baking Show as we are? If so, you might be interested in nibbling on the following recipe while watching the next episode on PBS. 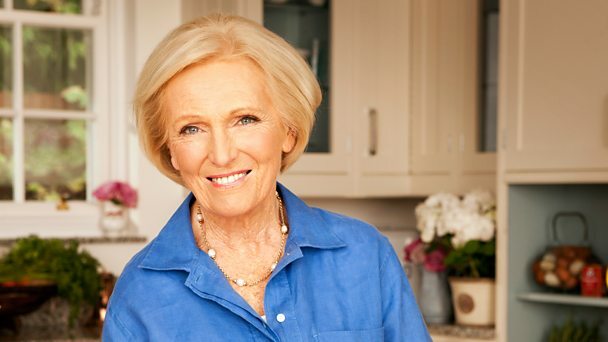 It was created by Judge Mary Berry and featured on her BBC series "Mary Berry's Absolute Favourites." We're forecasting that it will soon be one of your "Favourites" as well!